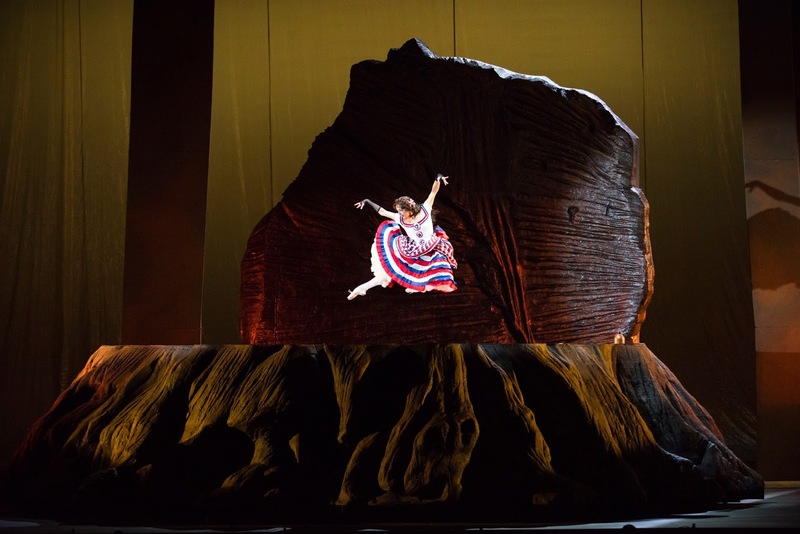 Dance Commentary by Heather Desaulniers: "Girls of the Golden West"
"Girls of the Golden West"
Usually I make only one December visit to the War Memorial Opera House, but his year, I’m making two trips. One, for the familiar yearly classic, San Francisco Ballet’s Nutcracker. The other, a first for me. This past weekend, I took in the closing performance of San Francisco Opera in Girls of the Golden West, a new full-length, two-act work composed by the much-celebrated John Adams, with libretto/direction by Peter Sellars and choreography by John Heginbotham. Girls of the Golden West transports its audience to Northern California’s gold country, to mining camp life in the mid-1800s. And while this opera is seated in that time and era, it is really about the people who lived and experienced everything that the gold rush held, telling their stories of hope, possibility, determination, desperation, infidelity, paranoia and ultimately, savagery. In the opera’s three plus hours, Dame Shirley, Ned Peters, Joe Cannon, Ah Sing, Josefa (and more) take the viewer on a journey where extremes reign - moments where infatuation and heartbreak meet as do wins and losses, and most telling, humanity and inhumanity. Choreographically, Act I is made up mostly of stage movement, both for the soloists and for the chorus. Though there were a few stylistic, dance-y interludes. A sweet, frontier-inspired, square dance duet for Ned (Davóne Tines) and Dame Shirley (Julia Bullock) unfolded early in the Act. And then, once the narrative made its way to The Empire Bar, a mining encampment saloon and brothel, there were a number of gestural movement phrases for the women corps dancers. Act II begins with a ‘show within a show’, a Fourth of July celebration being performed for the miners on a large stage platform, cleverly fashioned as the trunk of an enormous Redwood tree. The corps dancers opened with percussive steps, pinwheel formations and folk-inspired sequences of pas de basque. Then, Lorena Feijóo (former Principal Dancer with San Francisco Ballet) entered the space as Lola Montez and offered Montez’s Spider Dance. Heginbotham’s choreography for this featured solo mixed intrigue with vigor, all steeped in classical ballet structure and pointe technique. Filled with sky-high Russian pas de chat, riveting bourées and an extreme extension in second position, Feijóo communicated each step and phrase with her signature passion and fire. And throughout the dance, she threw her hand outward like she was spinning a web of spider silk. Though sadly, if you were sitting in the orchestra section of the theater, you probably missed much of the footwork because her pointe shoes were partially obstructed by the set. Girls of the Golden West felt a bit long, but not because it was three hours and fifteen minutes, because there were several scenes that could have been shortened. Yet at the same time, the arc of the three main relationships didn’t feel completely fleshed out. And strangely on Sunday afternoon, the sound was a little curious. A number of times, the soloists were very hard to hear, and it didn’t seem like a piano or pianissimo dynamic marking in the score. It really felt like a sound balance issue. "Some of a Thousand Words"